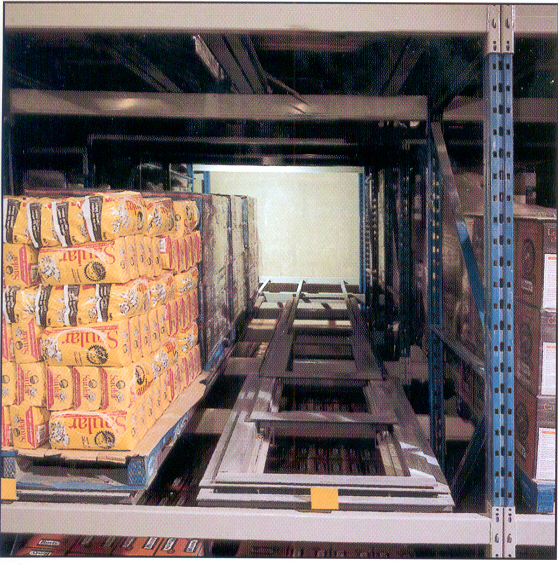 Push back racking is similar to drive-in racking, but the product comes to you. This eliminates driving into the rack to retrieve pallets. 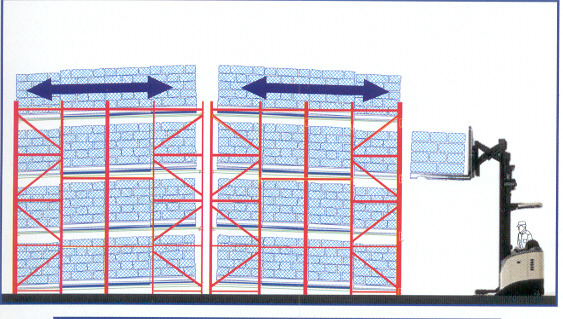 Advantageous for medium to low SKU counts, with medium to high activity and pallet in / pallet out. Selectivity typically reduced by 60% to 75% vs. Selective. Flexible - may use counter-balance or reach trucks. Eliminates driving into racks, required with Selective. LIFO within the lane, but modified FIFO may be achieved by sequential picking of lanes. Overall storage area can be reduced by more than 40% vs. Selective, in a typical 3-deep back to back system. While footprint is similar to Drive-In, utilization rates tend to be higher, resulting in even better space savings.